Light as a feather, soufflés melt in your mouth leaving a lingering fruity flavour and a longing for more. It is easy to master this lofty, fluffy dish and you could fool guests into believing that you are a master chef. What’s more, you don’t have to feel guilty about biting into the heavenly sweet-dish because the main ingredient in these soufflés is fruit. 8 eggs (separate yolks and whites), 200 gms figs, 500 gms whipped cream, 80 gms flour, 120 ml milk, 80 gms melted butter, 160 gms sugar. Mix flour, milk, yolk together and cook in a double boiler till it reaches a custard-like consistency. Add melted butter when done and mix thoroughly. Beat egg white and sugar till stiff. Chop the figs. Mix egg yolk mixture, cream, stiff egg whites, figs and set in refrigerator for one hour. Garnish with white and dark chocolate and a few slices of fig. The word soufflé is derived from French wherein it literally means ‘puffed up’. Supposedly, the first recipe for soufflé appeared in Vincent La Chapelle’s, Le Cuisinier Moderne in 1742. Over time, master chefs began experimenting with this dish and recipes for different kinds of soufflés evolved. In 1841, Careme’s Patissier Royal Parisien goes into great detail on the technique of making soufflés, from which it is clear that cooks had been having much trouble with soufflés that collapsed! 5 eggs (separate yolks from whites), 480 gms sugar, 1 litre milk, 20 gms gelatine, 2 fresh kiwi or kiwi crush, 1 kg whipped cream. Mix egg yolk, 300 gms sugar and milk together. Cook in a double boiler till it reaches the consistency of custard. Beat the egg white together with the rest of the sugar till it turns stiff. Soak gelatine in 50 ml water and cook in a double boiler for 10 minutes on low flame. Chop the kiwi into fine pieces. Mix custard, stiff egg-whites, cream, chopped kiwi or kiwi crush and set into individual moulds. Allow it to set in the refrigerator for one hour. 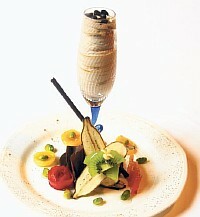 Garnish with a sesame basket filled with dark chocolate and slices of kiwi. 6 eggs (separate yolks from whites), 6 bananas, 15 gms coffee, 500 gms cream, 100 ml custard sauce, 15 gms gelatine, 50 gms castor sugar. Whip egg white with sugar till stiff. Puree the bananas in a blender. Dissolve coffee in little water and mix with puree. Melt gelatine in 20 ml water. Mix in cream, custard sauce, stiff egg whites, banana puree and keep whipping it together until it reaches custard-like consistency. Set in individual moulds or decorative glass bowls. Serve with a sprinkling of coffee powder, coffee beans and garnish with a slice of banana. 5 eggs (separate yolks from whites), 420 gms castor sugar, 1 kg whipped cream, 4 peaches, 100 ml water. Add 100 gms of sugar and egg yolk to the water and whisk thoroughly. Put the mixture into a double boiler and cook till it reaches the consistency of custard. Beat egg white and sugar till stiff. Finely chop the peaches. Mix egg yolk mixture with the cream and peaches, and set in refrigerator for one hour. Garnish with chocolate and peach slices and add a dash of berry sauce. 8 eggs, 100 gms blackberries, 100 gms milk, 500 gms whipped cream, 100 gms glucose, 300 gms castor sugar, 320 gms regular sugar. Dissolve glucose in milk, add granulated sugar and cook in double boiler till it reaches a custard-like consistency. Beat egg whites till stiff, adding castor sugar gradually. Cook blackberries in the pan till they ooze water and take it off the gas. Mix glucose mixture, egg white, cream and blackberries together and set in individual moulds. Garnish with glazed gel, chocolate, blackberries and a mint leaf.